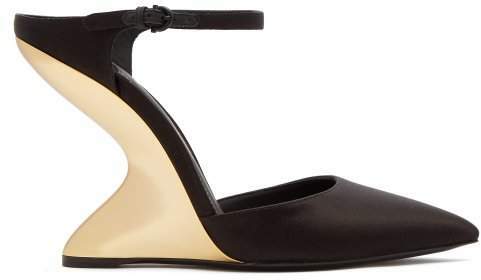 Salvatore Ferragamo - Salvatore Ferragamo's black satin Naturno mules are named after a small town in Northern Italy. 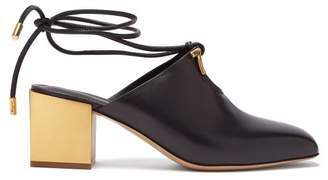 They're crafted with a point toe and a buckle-fastening ankle strap, then set on a inverted gold-tone metal F wedge heel – a design element lifted from the house's archives. Team them with a structured tweed dress and a matching clutch for after-hours socialising.